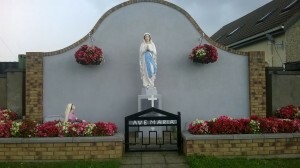 The Parish of Thurles has two Catholic Churches. 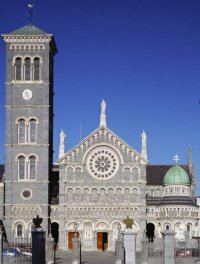 The Cathedral of the Assumption – consecrated in 1879 and The Church of St. Joseph & St. Brigid, Bohernanave built in 1971. The two buildings contrast the new and the old. The Cathedral is the fourth church to be built on this site. The first one recorded was a Carmelite church built in the early fourteenth century. After the dissolution of the monasteries in the 1530’s it fell into disrepair. The second church, known as the Matthew Chapel was built around the mid eighteenth century under the partronage of George Matthew who lived in Thurles at the time. 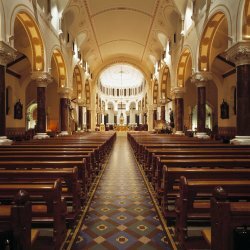 The third church built on the site was known as the ‘Big Chapel’ and was dedicated to Saint Patrick. This church was a spacious, T-shaped building built between 1807-1808 at a cost of £10,000. The big chapel served as the Cathedral until the early 1860’s. The fourth Church built here is the present Cathedral. Work began on it in 1861. Dr. Patrick Leahy who was Archbishop at the time decided to replace the ‘Big Chapel’ with a more grandiose structure. He regarded the ‘Big Chapel’ as “not worthy of this great diocese much less to be the metropolitan church of Munster”. Dr. Leahy loved all things Roman: chant, Roman ceremonies and buildings. The Archbishop engaged the well-known and established church architect of the day, J.J. McCarthy, who abandoned his normal Gothic revival style to accommodate Dr. Leahy’s preference. So McCarthy used an Italianate Romanesque style. The Cathedral is modelled on the Cathedral of Pisa in Northern Italy. The foundation stone was laid in 1865 and by 1870 it was roofed and the work began on the interior. The consecration was performed by Dr. Leahy’s successor, Dr. Thomas Croke on 22nd June 1879. The total cost of construction of the Cathedral was £30,000. The bulk of the finance came from within the Diocese and the debt was cleared by its completion. Dr. Leahy was a skillful fundraiser. He levied each parish according to its ability to pay thus maximizing the return from the diocese. Dr. Leahy visited every Church in the Dioceses seeking support for the Cathedral and he also sent collectors abroad to Canada, America and England to tap the Irish in these countries. The most interesting and beautiful feature of the Cathedral is the high-domed and elaborate tabernacle. This was designed by Giacoma della Porta who was one of the architects of St. Peter’s Basilica in Rome and was a student of Michelangelo. This tabernacle was made for the Gesu Church in Rome. 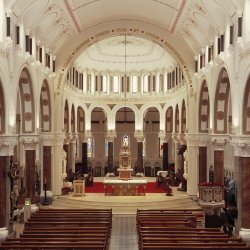 When the Gesu was being renovated in the mid-nineteenth century, Dr. Leahy purchased the tabernacle for Thurles. It is made from giallo antico, rosso antico, africano – beautiful antique marbles. The door is bronze with a silver host bearing the letters I.H.S. The two front pillars are Galway marble. The tabernacle rested on the Altar until the renovations of the 1970s. The Altar is of white marble inlaid with precious stones (malachite, lapis, lazuli, rosso agate, to mention a few) and a variety of other marbles. The white marble is supported by an arcading of sixteen columns – six of which are yellow Sienna marble, six griotte and four of vert campan – with their bases and capitals of bronze supporting the table of the altar which rests on solid masonry. On one side of the Cathedral, to the left as you look from the front gates, is the bell tower or campanile which is one hundred and fifty feet high and is Thurles’ most important landmark. The tower clock was presented to the people of Thurles by Dr. Croke on the occasion of his silver jubilee in 1895. Originally it had three faces but a fourth was added later. On the other side of the Cathedral is the free standing Baptistery which resembles that of Pisa and other European Cathedrals in being separate from the main building. It is built in the Byzantine style of limestone quarried locally. The dome of the baptistery was recoated with copper in 1927. The Baptismal Font in the Baptistery is unusual in that it was originally used as a fountain. Sea horses support the basin and it has four inter-twined serpents carved above its upper rim. A stained glass window in the baptistery appropriately depicts the Baptism of the Lord. The Rose Window in the façade of the building was designed and erected by Messrs. Mayer and Co. of Munich. The stained glass windows in the apse behind the sacristy portray figures from the Bible of Christ, of Our Lady and the saints. These are situated in the north transept of the Cathedral. They are the work of Mark Ryan, liturgical designer. They are made of cast bronze mounted on Portland stone. The new font was necessary to accommodate the large numbers attending christening ceremonies and its presence in the cathedral building is a constant reminder to all visitors of our faith journey. The Aumbry contains the holy oils – Catechumens; Chrism; Infirmorum; that are used in the celebration of the sacraments of Baptism, Anointing of the Sick, Ordination and Confirmation. 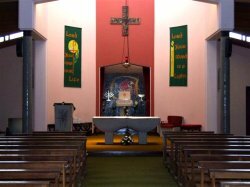 The former mortuary chapel and later the Croke chapel is the Blessed Sacrament Chapel since 1997. As part of the recent restoration project Mark Ryan was commissioned to design a new repository for the Exposition of the Blessed Sacrament. Linking with the Aumbry and new Baptismal Font we see his use of cast bronze mounted on Portland stone. His design is inspired by the story of the ‘Burning Bush’ in Exodus 3: 1- 6. From the middle of the bush Yahweh spoke to Moses and dcelared himself to be “the God of Abraham, Isaac and Jacob”. It was here that Moses accepted God’s call to free his people from slavery in Egypt. 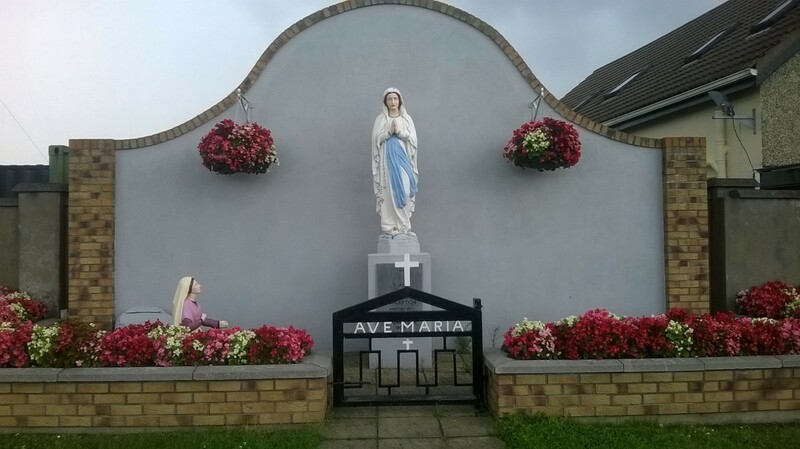 The growth of population, the outward spread of housing and a preference for Sunday Masses during the late forenoon – these factors have created the need for a second church in the parish of Thurles.” Archbishop Morris, 1971. After much discussion it was decided to build the new Church on a 1.5 Acre site at Bohernanave which was generously offered free by the Hayes Family. The Architect was Patrick J. Sheehan of Limerick and the builder was John Ronayne, Thurles. The contract price for the new church and presbytery was just short of £100,000. The church was officially opened and blessed on October 6th , 1971. The New Church, as it is still known and called today by many people, is dedicated to St. Joseph and St. Brigid and was built to accommodate 700 – 800 people. The church was designed in accordance with the Liturgical Norms of Vatican II. No one is more than 50 feet from the altar; in the Cathedral by contrast, the front seat is 50 feet from the present position of the Tabernacle. The exterior of the Church was designed to fit in with the surroundings. The sanctuary is octagonal and the seats for the congregation radiate out from five of its sides to make a fan-shaped structure. The Blessed Sacrament is reserved in a special small chapel behind the altar, so designed that it will be unobtrusive during Mass but will be the focus of attention when the liturgy is not in progress. The tower is designed to reflect light down on the altar. The altar is a solid block of natural granite with a St. Brigid’s Cross inscribed on the front. The Priest’s Chair is granite too and so is the Ambo or pulpit, which has a metal eagle fixed on the front to symbolize the Word of God. The mosaic on the wall of the Blessed Sacrament Chapel depicts the Paschal Lamb unifying the Old Testament, represented by the seven-branched candle-stick and scroll, and the New Testament, represented by the chalice, wheat and grapes. The human figures symbolize the People of God being led to salvation by the Lamb. The silver Sanctuary Lamp is one presented to the old Chapel of Thurles in 1839 as a joint gift of Archbishops Bray and Slattery. The six stained glass lancet windows, which cost £155.50 each, are dedicated to the Sacred Heart, Our Lady, St. Patrick, St. Joseph, St. Brigid and St. Ailbe. The simple lines of the Stations of the Cross are clear and unostentatious. While contrasting both buildings – the old and the new, we must also remember that we build for the future on the foundations of the past. We have inherited more than just buildings – we have inherited a belief in and love of God that cannot be bought. We must remember with fondness and affection those who gifted us with faith and make sure that not alone our inherited buildings are preserved but also the faith of our ancestors be kept alive in the Cathedral town and its environs.